Manchester United have a number of injury issues to contend with heading into what is probably their biggest game of the season. Antonio Valencia and Eric Bailly are ruled out of the contest, while Ander Herrera is also set to miss out with an injury. Nemanja Matic is a doubt for the game, while Alexis Sanchez also remains out despite having returned to training. Marcus Rashford missed the last game against Wolves with an ankle injury, but has trained with the team and Solskjaer said in his pre-match presser that the England international should be ready for the game. David de Gea is the undisputed starter in goal for the home team, and he will need to be at the top of his game to keep out the Barcelona attackers. Chris Smalling and Victor Lindelof will start out as the central defensive partnership and will have to deal with the dangerous duo of Luis Suarez and Lionel Messi. Ashley Young and Luke Shaw will be stationed as the full-backs on the right and left sides respectively. Both will have their tasks cut out going up against the Catalans and will need to be watchful as a booking would lead them to miss the second leg at Camp Nou. With Matic and Herrera doubts for the game, Solskjaer might be forced into tweaking his midfield setup, opting for a two-man pivot comprising of Scott McTominay and Paul Pogba. The latter has been in poor form of late and will need to step up in a big way. Diogo Dalot should get the nod on the right flank to provide additional protection against the onrushing Jordi Alba, while Rashford, should he be passed fit, will take up the left-side. Jesse Lingard is likely to slot in as the No.10 for Manchester United, with Romelu Lukaku leading the line as the lone striker. Thomas Vermaelen and Rafinha are the only injury-enforced absentees for Barcelona. Ousmane Dembele has traveled with the squad, but is not fit enough to start and could be restricted to an appearance from the bench. Jean Clair Todibo has been named in the 22-man travelling party by Valverde, despite not being registered. There is no looking past German international Marc-Andre ter Stegen in he Barcelona goal. Gerard Pique is nailed on to start as one of the two centre-backs on his return to Old Trafford. He is likely to be partnered by Clement Lenglet again, with Samuel Umtiti struggling to regain form since returning from injury. Jordi Alba is a guaranteed starter at left-back, while the right-back slot will be a toss-up between Sergi Roberto and Nelson Semedo. The former has been preferred in recent games and is likely to get the nod again. Sergio Busquets will slot in at the base of the Barcelona midfield and will look to act as the conduit between the two halves of the pitch. He will be supported by Croatian international Ivan Rakitic, while Arthur will be tasked with controlling the tempo of the game from the middle of the park. 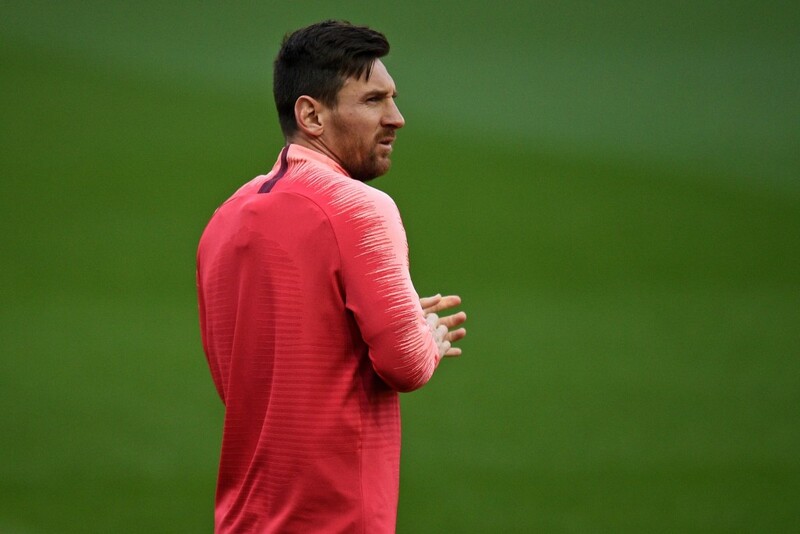 Lionel Messi has been in scintillating form of late and will be Barcelona’s biggest attacking threat, while Luis Suarez will also be a menace to the Manchester United defence. Philippe Coutinho is likely to get the nod on the left flank again in Dembele’s absence, but the Brazilian needs to do more than what he has been doing in recent matches. This is the first Champions League meeting between Barcelona and Manchester United since the 2011 final, which the Catalans won 3-1 at Wembley. Manchester United have never lost a home game against Barcelona (W2 D2 L0). Wednesday’s encounter will be the first meeting between the two sides at Old Trafford since the second leg of the 2007-08 Champions League semifinal, which had ended in a 1-0 win for the Red Devils. This is Barcelona’s 17th Champions League quarter-final appearance, a joint-record with Bayern Munich; they have qualified for the 12th successive season, a competition record. Manchester United have won just two of their last 11 Champions League knockout ties (W2 D3 L6), failing to win both of their quarter-final games in the 2013-14 season under David Moyes against Bayern Munich.